2 classic Berenstain Bears school stories in 1 book! 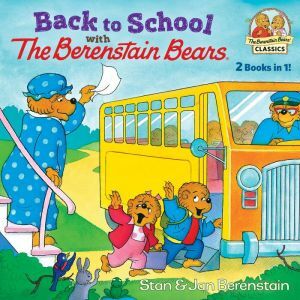 Head off to school with two bestselling Berenstain Bears stories in one book! Featuring The Berenstain Bears Go to School and The Berenstain Bears' Report Card Trouble, this full-color storybook is the perfect back-to-school addition to your Berenstain Bears collection. Sister is nervous about starting school, so Mama takes her to meet the teacher. Finally, she's eager to go with Brother on the first day to begin her school adventure. Brother's involvement in school sports causes his grades to drop. After they ground him, Mama and Papa realize that supervising and supporting him is a far more constructive strategy.